A very interesting article about the life and work of Natalena Koroleva. Ukrainian version available. Was born in Spain, her mother was a Spaniard, and her father was a Pole. 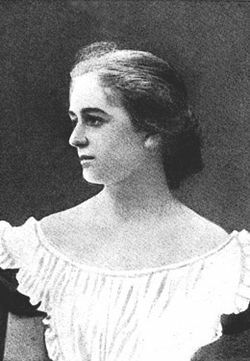 She started to write fiction works in Ukrainian language in 1919 upon the recommendation of her husband – a famous public figure, writer and artist V.Koroliv-Staryy. Her first story in Ukrainian “Sin (From the Remembrance Book)” was published in Vienna’s Ukrainian weekly “Freedom” (“Volia”) (1921). Since that time all West-Ukrainian, Bukovinian, Transcarpathian Ukrainian magazines, as well as magazines published in Czechoslovakia, included her works. N.Koroleva’s books published in the middle of 30-ies – at the beginning of 40-es brought her public recognition and popularity: collection of legends “Once Upon a Time” (“Vo Dni Ony”) (1935), narratives “1313” (1935), “Without Roots” (1936), collection of stories “A Different World” (1936), narratives “Ancestor” (1937), “A Dream of a Shadow” (1938), “Ancient Kyivan Legends” (1942-1943).